Question: The peregrines’ nest on bare gravel looks stark and uninviting. Why don’t they use sticks? And why is the nest called a scrape? Answer: Bird nests come in many forms. Robins build nests of mud and grass. Bald eagles and red-tailed hawks build nests of sticks. Bluebirds and chickadees nest inside boxes or woodpecker holes. Peregrine falcons and killdeer nest in gravel on the ground. Peregrines eat birds which they catch in flight by tail chasing, “ringing up,” or diving from above at speeds of up to 200 mph. They nest where their prey is plentiful and choose a high, exposed location where they can watch prey from above. They like a long view. Peregrines nested exclusively on cliff ledges until the Peregrine Reintroduction Program introduced them to buildings and bridges, structures that have a lot in common with cliffs. One of the peregrine’s favorite foods — the rock pigeon — also nests on cliffs, buildings and bridges. It’s nice to have dinner close at hand. The female chooses the nest site after the male shows her several options on the cliff or man-made structure. She prefers south-facing ledges with an updraft, an overhang to keep off the rain, and no proximity to humans and great-horned owls. The ledge must have sand, gravel, loose soil, or dead vegetation that’s deep enough to dig out a bowl for the nest. The nest bowl is called a scrape because the male and female scrape the depression by placing their breasts against one edge and kicking back with their legs. The scrape prevents the eggs from rolling off the cliff and provides an edge to keep in heat during incubation. 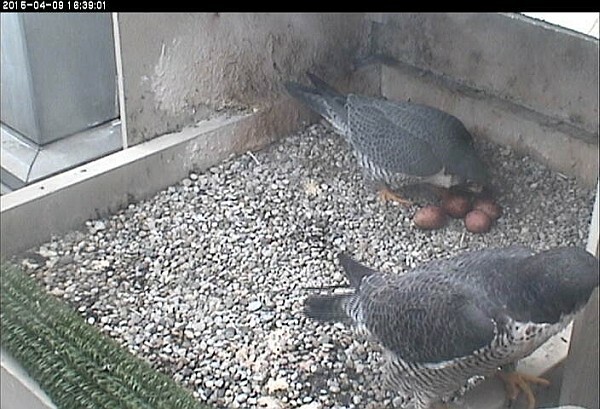 Peregrines don’t add anything to the nest because it doesn’t need anything else. It is high and safe and their brood patches keep it warm. If the cliff doesn’t have deep gravel on a safe-from-intrusion ledge the peregrines choose the best ledge they can. However the nest will fail if the scrape is not deep enough. Peregrine falcons sometimes choose man-made structures that lack deep gravel. When this situation occurs in a place where peregrines are still endangered, the wildlife management agency provides a nest box with deep gravel in hopes that the peregrine pair will use it for better success.